This page signed by C. R. Davis of Belfast, Maine, was in an autograph album signed mostly by students at Bradford Academy in Bradford, Massachusetts. He signed in October of 1873. 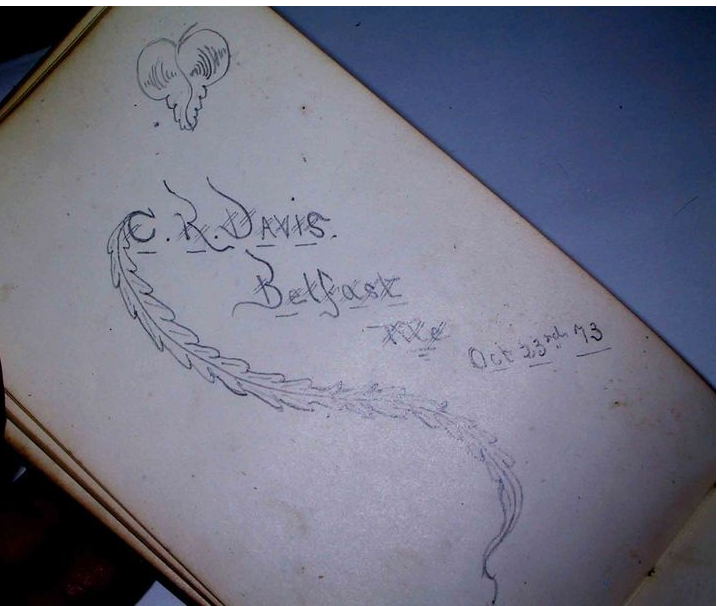 I don't know if C. R. Davis attended the Academy or if the owner of the album came from Maine, as some other signers did, and he signed the album in the Belfast, Maine, area. It's possible that C. R. Davis was Cyrus R. Davis, who was born at Belfast, Maine, on 1 September 1846, the son of Phineas and Mary Davis. I also found Phineas as Phinehas. On 22 October 1877 at Belfast, Maine, Cyrus married Mary E. Sleeper, daughter of Sherburne and Mary Elizabeth (Longfellow) Sleeper. In the 1880 Census, Cyrus and Mary, with no children listed, were living at Belfast, Maine. Cyrus gave his occupation as fruit dealer. Mary died 12 January 1886 at Belfast. Cyrus may be the Cyrus Davis who was boarding in the home of Lucy Dearborn in Wakefield, Massachusetts at the time of the 1900 Census. There was a Clarence Davis also boarding in the household, but I don't know if there was a relationship between the two or not. If you have any theories as to the identity of C. R. Davis of Belfast, Maine, please leave a comment or contact me directly.